The Malibu is Chevroletâ€™s midsize sedan that receives a complete makeover for 2008 with a new bolder design including a dual-port grille and upscale elements such as an available two-tone interior. 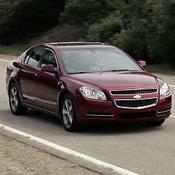 The 2010 Malibu is a 4-door, 5-passenger family sedan, available in 4 trims, ranging from the LS to the LTZ. The LS is equipped with a standard 2.4-liter, I4, 169-horsepower engine that achieves 22-mpg in the city and 30-mpg on the highway. The LTZ is equipped with a standard 2.4-liter, I4, 169-horsepower engine that achieves 22-mpg in the city and 33-mpg on the highway. This car stands up well even at 132,000KM, it still drives the same, responsive steering, aggressive power easily walks away from cars in the same caliber. Still very quiet inside, great choice of tires with Goodyears even in the north. paint is still amazing. Thought about trading up but no thanks. Every vehicle has it's good and bad but bang for the buck, this car is a definite keeper. I get compliments on it all the time. The strut bearings didn't last long and front bearings had to be replaced but other than doing one brake job, nothing is loose on this car. I've owned many other cars in my life and I like where chevy was going with this one but what happened, they downgraded to a 4 cylinder, dropped the 3.6 in the impala and, that figures, too bad. I will keep this car alive and enjoy it but I was really hoping for newer and better. Great looking vehicle especially the two tone dashboard. Gas mileage is great! From the very first day we bought this vehicle, we have been dissatisfied! The performance is good but the interior cannot be kept clean (unless you drive on highway only) Dust literally pours inside the vehicle through the door jams and covers the seats! Ladies - forget about wearing nice clothes in this vehicle...it can't happen!! If chevy fixed this problem for us, we would be satisfied. Other than that, we would never buy another one! We like Chevy. Our last vehicle was a Silverado, but we really regret buying this Malibu! It looks amazing inside and out. it had some body damager from vadalizim, but i was able to fix it up for pretty cheap and now i work 4 GM! I <3 new car bc i never thought id be driving something American where b4 i only drove German, but GMs new designs have changed my mind. Wish i had leather seats and sunroof. Gr8 car for the $! Took my car into dealership for wet floor boards. They said it was caused by a clogged hose on the AC and the extended warranty that they push will not cover the repairs. They said it was not a uncommon in the Malibu due to design. Couldn't argue with the price. The dealership was having a huge sale. The MSRP was close to 24K yet the various discounts, which required no haggling on my part, brough the price below $19000. It's pretty obvious that the build quality, handling predictability, and fit and finish of American cars doesn't quite measure up to their Japanese counterparts, but you get a lot for your money with the Malibu. We bought the Maxx (hatchback version) for the fairly large cargo area and the adjustable pedals, as my wife and I have a pretty notable height differential. The interior is huge, considering the size of the car, and there are plenty of cupholders and storage area. Also, I like the dimming lights, 6 speaker audio, 200 HP, and all the features that you usually don't get in a car under 20K. Passing power on the highway is excellent too. The biggest drawback is the steering and handling. The car feels loose and buttery around turns and, in general, has very soft handling. You could steer with one pinky and not put much effort in, and there's oversteer when going around sharp turns. Oddly, though, the steering becomes horribly stiff in the cold weather until the car warms up. Now the intermediate steering shaft section is making clunking noises and needs to be replaced. The rear visibility is poor, but that is the case with a lot of cars these days, given those bulky C-pillars. We've had to replace the remote batteries multiple times.One more minor quibble is that the driver's door armrest is really hard and uncomfortable on a long trip. Gas milage is low 20s, which is normal for a 200 HP family car. its not a true chevy! Where do I start? Strengths are from bumper to bumper. A bigger gas tank would have been nice... I like to go on road trips. Believably a remarkable car. Outstanding in every area and a superb deal. I drove EVERYTHING else to see if I could find anything else as good, and the answer was a confident "no". GM did an awesome job! A major win for the home team. Every 4 door sedan on the market, from the small, mid, to large classes. let's see at 23k the car had 3 major oil leaks at 49k 5 rocker arms needed replaced with 1 going thru the head. at 60k 1 year later another rocker arm goes thru the head. chevy says it's not a lemon and only wants to give me $500 towards a new chevy. they state because I didn't have to pay anything it's not their problem. but I had to pay for the tow truck sit out in the cold for over an hour for the tow truck to get there. what happened to reliablity. isn't that why you buy a new car. this car has also had many minor problems too. it has been to the dealership too many times to count. I have to say this is the last chevy I ever buy. Great looks,interior, roomy rear seat with plenty of knee room, fit and finish and gas mileage. Purchased car 6/22/07 with 23k miles. I have owned it for 59 days of which it has spent 8 days (and counting) in the shop for major repairs. It has had security system replaced and is currently in the shop to rebuild the transmission. Dealer, Quirk Chevy - Portland, ME, first offered to replace the vehicle for something comparable. They then decided to replace but NOT at full price I paid.